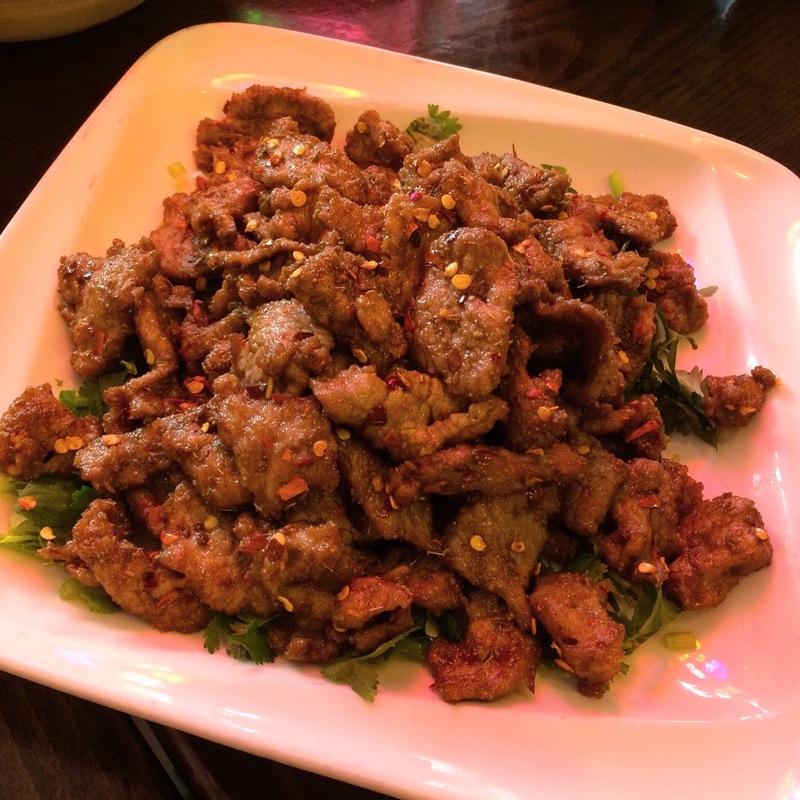 Continuing with Henan and comfort food themes, here’s a dish from He Nan Cuisine aka He Nan Flavor, aka Henan Feng Wei, formerly connected to what is now Spicy Village on Forsyth St in Manhattan. 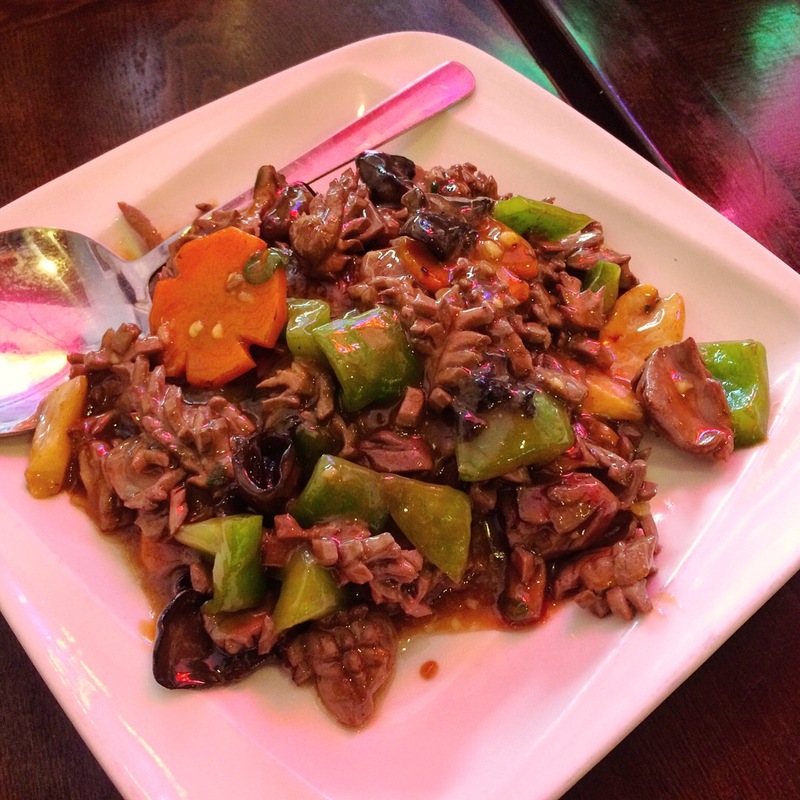 Located in Flushing, Queens at 136-31 41st Ave, it’s easy to miss; you need to descend a few steps to access this old school super casual restaurant. No English was spoken but the menu provided adequate translations of their fare and I was fortunate that on this particular visit one of my dining pals spoke the language. I’ve enjoyed Kou Wan previously at Elmhurst’s sadly missed Uncle Zhou. Here, there are eight variations from meat ball, ground meat, and chicken to this one, “crisp meat”, all available with or without noodles. 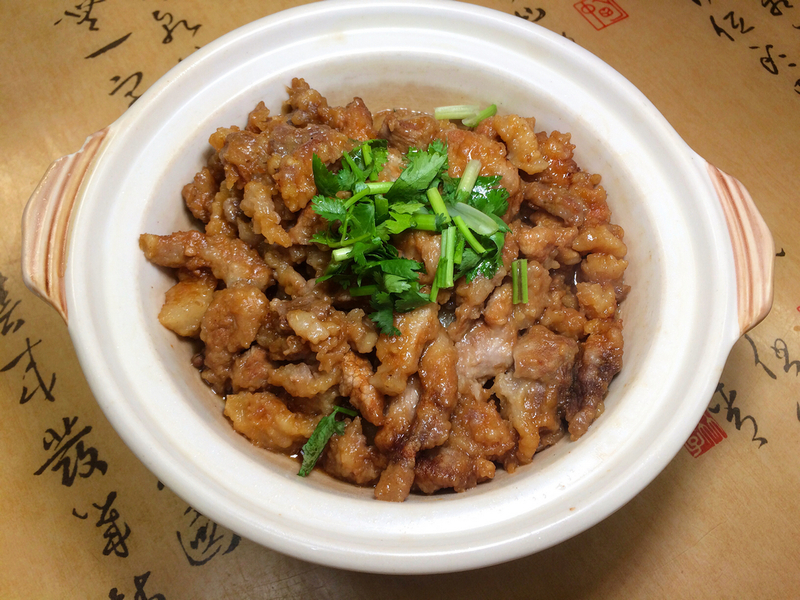 It’s a simple, homespun dish consisting of meat that’s been floured, fried, and simmered in a sauce seasoned with star anise and a touch of black pepper. Despite its name, don’t expect a bowl of crisp meat; I suspect that these nuggets had indeed been crispy bits of pork prior to preparation but the end result is soft, succulent and delicious. With so many more promising dishes on the menu, I’m looking forward to a return visit. I’ve always been a fan of Henan Chinese cuisine. 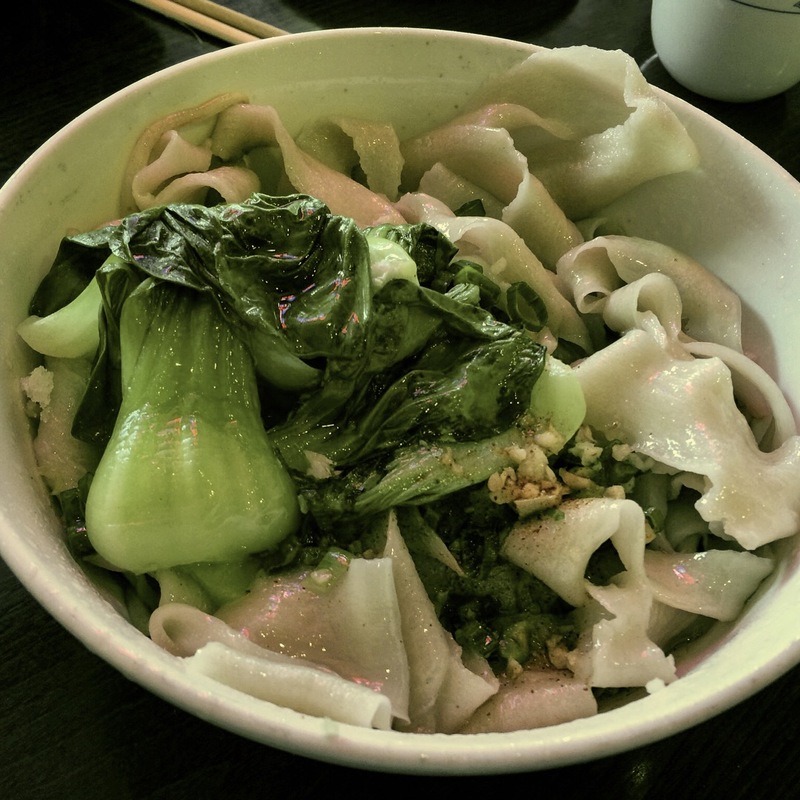 No, not Hunan, I love that too, but Henan food is harder to come by in our fair city and since the disappearance of Elmhurst’s Uncle Zhou, the pickings have grown even slimmer. Miss Li Henan Cuisine at 133-49 Roosevelt Ave, Flushing, Queens, has a number of dishes I need to try, but this visit would be a quick one, a stop on one of our eat-our-way-through-Flushing jaunts, so we only had time (and belly real estate) for one dish – case in point: Handmade Cold Noodles (gan mianpi). 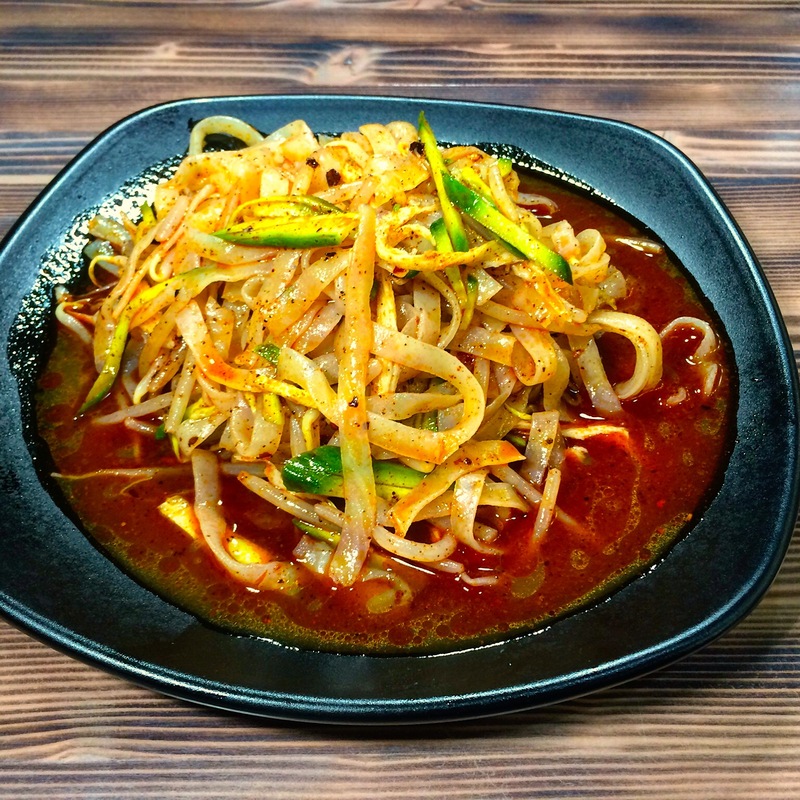 🍜 Dotted with bean sprouts, slivers of cucumber and a few other touches, the spicy, saucy, chewy wheat flour noodles hit the spot on a dreary, rainy day. Now firmly ensconced in the former digs of Henan cuisine champion Uncle Zhou, Chef Guo at 83-29 Broadway in Elmhurst, Queens, is the new kid on the block. Featuring some items that were similar, at least in name, to those of the avuncular hero plus many new ones, they’re boldly striking out with a menu of less familiar offerings and that always makes me happy. Chef Guo hails from Liaoning province in China and I suspect some of the new dishes may represent that cuisine. Dial Oil Hand Drawn Wide Noodle (if the quirky name sounds familiar, it was on Uncle Zhou’s menu as well). Thick noodles with a properly sassy chew, the sauce was the kind of soy-vinegar-chili oil mixture that often accompanies dumplings. Stewed Pork Noodles with Pork (“pork broth” is my interpretation). 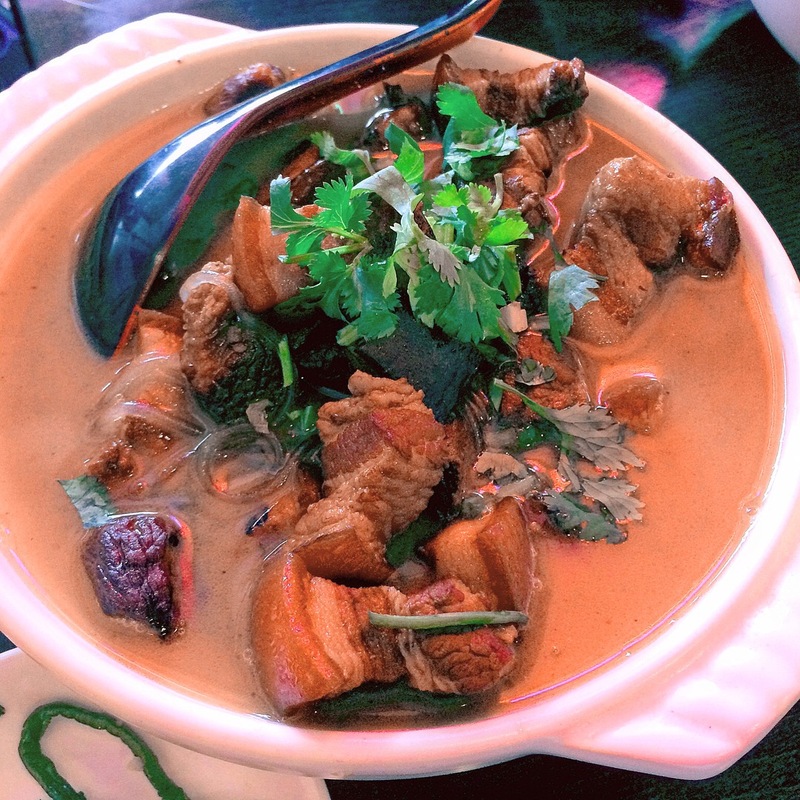 Cellophane noodles in a tasty broth with an abundance of extremely tender and flavorful chunks of pork belly. Probably our favorite dish at that lunch, but the menu is extensive and deserves further exploration. Sautéed Pig Kidney, again very tender (the kitchen has this trick down). I’m a fan of organ meats, so no complaints from me on this one. Very mild flavor without the oft present overtones that are off-putting to offal skeptics. Crispy Lamb with Chili Pepper. Dare I say tender again? Because it was lusciously so. Not overly spicy – it could have used a bit more punch – but they may have been playing it safe with us. New kitchen, new patrons, you get the idea. But the dish was quite good nonetheless. Okay, this was one of the “less familiar offerings” I referred to earlier. The menu calls it Minced Meat Mashed Potatoes, the photo captions it Meat Foam Mashed Potatoes, but either name would have been sufficient cause for me to order it with a wink and without hesitation. 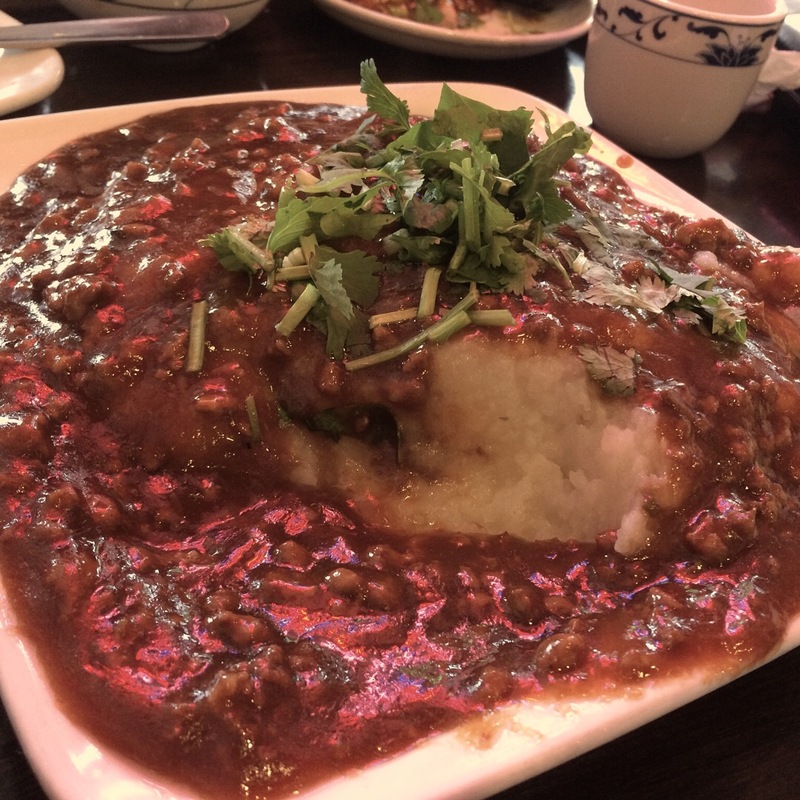 It was pretty good and certainly filling – mashed potatoes drowning under a savory, meaty sauce. I didn’t ask what kind of potato they were using but my guess is that it wasn’t the standard issue American spud since it had a slightly sweet flavor that elevated the dish.